Why does he say Tiger Wylde...the first? Well of course Doom won. 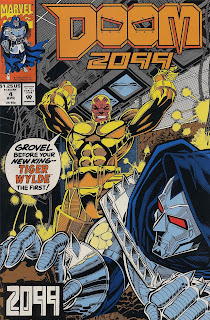 We last left Doom about to fight Tiger Wylde, a man who eviscerated him in Doom 2099 #1, and after reading Doom 2099 #4 we leave the comic of the day with only one metal clad man standing: Doom...of course. Making good use of foreshadowing in the past issue, John Francis Moore (Francis is truly a great middle name) uses Doom's new ability to phase his body through anything to defeat his foe. Doom suckers Wylde into a fight to distract him into being blown to hell by a massive explosion...which Doom phases through. Doom is always so theatrical. In Doom 2099 #4, Doom literally floats up and out of the flames and broken down mountain, cape floating behind, and announces, "I am Risen!" Who does that? 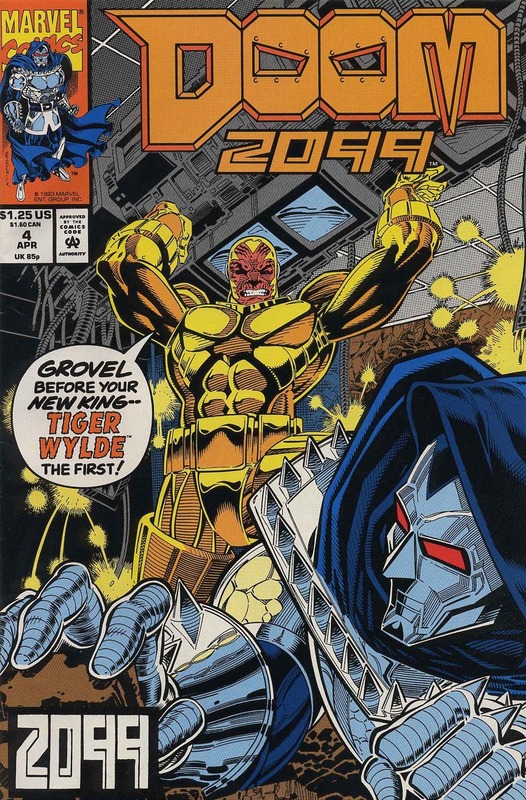 So now Doom controls Latveria once again. But his sights have been set on much more. He says he does not want to conquer the world, rather, Doom wants to become the world's architect: Mr. Doom Vandelay.